Yesterday, the Tacoma Weekly published an opinion piece I penned concerning the harmful effects of a B&O tax being charged by the City of Tacoma when other cities in the state do not have such a tax. Most notably: The City of Fife. The article is only in the printed version of the Tacoma Weekly. Pick up a copy today. Year after year, Tacomans watch in dismay as businesses relocate to Fife,to the suburbs in Pierce County, and to other cities to escape the cost and hassle of dealing with Tacoma's Business and Occupation (B&O) tax. The well-intentioned but ill-advised tax has left parts of Tacoma eviscerated while driving businesses into parking lot-saturated sea of strip malls across Pierce County. The destructive effect of the B&O tax on Tacoma has long been acknowledged but the political will to eliminate the tax has always been lacking in Tacoma. The City has increasingly become dependant on the tax, enacted in 1951 on private businesses. Meanwhile, non-profits and large government entities have managed to avoid the B&O tax as well as other taxes. Numerous council members and business owners have acknowledged the problem including Mayor Strickland and Council member Fey. The B&O tax has become like a heroin addiction for of the City of Tacoma: pleasurable in the short term but harmful, destructive and in the long term and tough to shake. If Tacoma is going stop the hemorrhaging of private businesses from the city and compete for new businesses, it is going to have to go cold turkey and repeal the business-killing tax. Mayor Strickland has wisely proposed raising the threshold for the tax to $250,000 of gross business earnings per year. This is a good start to demonstrate that Tacoma is interested in becoming a city with significant private businesses rather than just governmental agencies. However, it will not be near enough to significantly retain medium and larger size businesses. Many small businesses have over $250,000 in gross sales. Tacomas geographic proximity to Fife had made Tacoma especially vulnerable to losing businesses to them. By forcing businesses out of the city, Tacoma has exacerbated sprawl into the suburbs and exurbs of Tacoma. This has been harmful environmentally as it has caused loss of farmland, greater pollution, and increased the dependency on automobiles in Pierce County. The City of Tacoma has spent millions on creating Platinum LEED building by placing grass on the rooftop on the South Park Plaza Parking garage and incorporating high tech features to the Center for Urban Waters building. However, the city could have achieved far better environmental results had it simply adopted policies which encouraged rebuilding and infilling in the city with residents and businesses through effective tax policies. Tacoma cannot simply declare it is competitive with other cities, it must make substantive changes that make it so. Tacoma can no more simply declare it is competitive with other cities, without making substantive changes, than a heroin addict can simply declare herself employable without overcoming the addiction. With the recent focus on the harmful effects of the B&O tax upon the health of Tacoma, now is the time for the city to act and to make Tacoma "open for business" once again. Erik Bjornson is an attorney who practices in downtown Tacoma and edits the online magazine The Tacoma Sun and writes for the Tacoma Urbanist. That could change in 2011. Tacoma City Council is expected to vote in October to modify its B&O tax ordinance. According to the city's tax and license division, if you are a business owner who earns $75,000 or more in gross revenue this year, you are required to pay the tax. Under a new plan spearheaded by Mayor Marilyn Strickland and supported by most city councilmembers, that so-called "threshold" could be raised to impact only business owners who earn more than $250,000 in gross revenue. If Council changes the ordinance, approximately 4,900 business owners who fall below that threshold would essentially receive a break on their B&O tax bill. It might be great news for small business owners, but it would leave the city looking for how to make up for what is projected to be approximately $1.4 million in lost revenue next year as a result of the change. by panachronic on 11/12/2010 @ 1:01am It's time to bring the city "up to market". That seems to be a fashionable idea at City Hall these days. by fredo on 11/12/2010 @ 7:34am Erik, your posting is spot on. I would like to clarify that currently businesses grossing less than $75K avoid the tax. However if the business makes even $1 more than this then they owe the tax on the entire gross amount, not just the $1. In other words, businesses don't get off the hook on the first $75K. For people who have never operated a business, $75K is a ridiculous threshold. Maybe this would have been an appropriate threshold back in the 1950s. The current threshold will not attract businesses which offer family wage jobs, in fact businesses with less than $75K aren't likely to have any jobs whatsoever. These businesses would be like people who have garage sales and the balloon guy from the farmers market. I can't see the sense for any threshold. If we want businesses with lots of employment then we want big businesses. Political leaders at city hall have been promising to do something about the tax for years. I would call it lip service. If the mayor gets a stain on her couch then the city gets all new office furniture immediately, but the b&o is like a syphilitic sore that just won't go away. Call me cynical, but my belief is that city labor unions will not allow the tax to be modified. by NineInchNachos on 11/12/2010 @ 8:11am If the Tacoma Urbanist calls for the elimination of the B&O tax then by golly we should get rid of it. Perhaps it would help keep our only Downtown art store. by Crenshaw Sepulveda on 11/12/2010 @ 8:37am I can see how paying $114 in B&O taxes for a retail business taking in $75,001 would be a "business killer". by The Jinxmedic on 11/12/2010 @ 8:41am I'm talking about a business generating several hundred million dollars in annual gross, one that was seriously interested in moving all operations from Auburn to downtown Tacoma. It is far simpler for such businesses to relocate to a more business-friendly environment. In this particular case, Nevada. Case in point - some of us are tiring of hearing about new furniture, new cars, $35.000 pay raises, unecessary pet projects- all at the expense of essential services. Closing libraries? Seriously? All I want is fiscal responsibility in local government. by jenyum on 11/12/2010 @ 9:11am Crenshaw, it's the "gross" part of it that is a problem. This is not a tax on net profits but on what comes in to the till. Doesn't matter if a business owner wants/needs to invest most of that money back into the business and take home a modest salary. by NSHDscott on 11/12/2010 @ 9:19am I can attest to fredo's point that the B&O is all or nothing at the $75K threshold. I remember about five years ago when my business grossed about $75,500 and got hit with a B&O bill of over $100. I can also attest that even though it felt like a ripoff, the tax bill didn't really hurt all that much. I mean, if you're a small business owner grossing $75.5K you could use that $100, but as CS said it's hardly a business killer. I'm sure that if you're a business grossing $250K and paying several employees, like my business will do someday, that tax bill will hurt a lot more. What's really ridiculous is that B&O is based on gross earnings instead of net. How ludicrous that your business could lose money (more expenses than deposits) and still owe the tax! Meanwhile another business could (in theory) gross $74K with zero expenses and pay no tax. by NineInchNachos on 11/12/2010 @ 9:32am the more I learn about Tacoma losing out on the Mint, the sadder I am. The Mint employs tons of highly skilled artists and craftsmen unlike Russel that employs George Jettson button pushers. by The Jinxmedic on 11/12/2010 @ 9:33am @ NHSDscott: There we are in a nutshell. The tax on gross earnings, not net profit, is the main problem. Businesses with small profit margins, or businesses that reinvest much of their profit back into business operations, are stuck. by Marty on 11/12/2010 @ 10:03am I believe the proposal of raising the B&O tax threshold to $250,000 included graduated percentages of tax due up to $300,000. ( only a small number of businesses fit into this range. ) In all this will help thousands of small businesses. Hopfully in the next budget the number can be doubled to $500,000 the following one to $1,000,000 and continuing the trend until the threshold of exemption no longer warrants it's existence. The real balancing act comes from how well does The City deliver services with a reduction of 25% ( about $80 million)? by cisserosmiley on 11/12/2010 @ 10:33am Marty, I wonder why "we" as a people would explore upping and upping the threshold when the ultimate problem is the structure of tax on ALL money -vs- tax on profits...is there not a way to make a tax on profit without too much "income tax" retoric flying around? Check your math crenshaw 75,000 x .0040 (service business rate) = $300/yr. It may not kill a business but it may be a factor which makes businesses elect to open outside the city limits. Most people I know would prefer to have $300 in their pocket instead of nothing. Yes this is the essential issue. IMO we should couple the B&O tax reduction to the reduction in city worker pay. In todays economy we are paying too much for city workers. Would some workers quit if they were required to give back 10 or 15 % of their pay? Perhaps. I doubt if very many would jump ship. There are no other jobs in the private or public sector most of them could go to. by The Jinxmedic on 11/12/2010 @ 11:19am Therefore, on a $300 million gross, the city's B&O is a $1.2 million tax- which for a large company with significant overhead, can actually exceed annual profits. Why would a company of that size do business in this city? by fredo on 11/12/2010 @ 11:34am When the city evaluates b&o tax rates and thresholds it's a little like a morbidly obese person trying to decide if it would be healthier to eat a case of doughnuts or a case of hershey bars. by Erik on 11/12/2010 @ 11:46am Great comments. It is true that the city relies on the B&O tax now. However, this has placed the city in a death spiral of sorts. As more businesses are driven out, the city becomes more desperate and reliant on the remaining private business that are here causing yet more of them to abandon Tacoma. This is like an alcoholic who complains that if he does get another drink, he will start getting the shakes. Yet, better to stop now than when the condition continues to worsen. Trying to retain business who are planning to move out is expensive. It is better to have a good tax policy in the first place. As it is now, places like the business districts such as the one in Hilltop sit blighted and nearly vacant while Fife is booming. The number of vacant and/or blighted buildings in the city is incalculable. by Crenshaw Sepulveda on 11/12/2010 @ 11:49am fredo, for retail the rate is 0.00153. I did specify retail and I am correct. You are correct about the rate for service businesses. Not sure where The Jinxmedic is getting his figures from. by The Jinxmedic on 11/12/2010 @ 11:58am I'm basing it on your 0.0040 rate for a service business. Bullion manufacturing is a service business with huge grosses, but relatively low profit. by fredo on 11/12/2010 @ 12:06pm I stand corrected, apologies crenshaw. Part of the problem is that different businesses get different tax rates and there are all kinds of complicating factors. Small businesses not only have to pay the tax they have to fill out a complicated quarterly form and their business may fall into various categories. Business owners who don't want to deal with the problem just open up across the street from the city limits. Why doesn't the city Dept. of Economic Development tell the council what's happening? Or is disinvestment in Tacoma a bold new strategy? As Erik has pointed out, isn't it more cost effective to try to retain the businesses that Tacoma already has than to replace them with businesses that like the cities tax structure? by Crenshaw Sepulveda on 11/12/2010 @ 12:37pm The Jinxmedic, I was assuming it was a manufacturing business at 0.0011 which would make the city b&o tax $330000. Why would it be considered a service business instead of retail or manufacturing? by fredo on 11/12/2010 @ 1:11pm Why quibble about the amount of the tax? A new business evaluating all possible sites for location isn't going to look favorably on ANY business tax. In Jinxmedic's example the tax is possibly $330K per year but if the owner is planning to operate the business for 20 years that expense is actually closer to $7,000,000. Why wouldn't he open up across the street from the city and put the millions in his own pocket? by The Jinxmedic on 11/12/2010 @ 1:23pm Bullion manufacturing is a commodity, therefore a service. Retail is a tiny fraction of the business in question. Don't forget, the city B&O tax is on top of the State's B&O tax. Neither exist in Nevada. by fredo on 11/12/2010 @ 1:42pm glad you brought up the state b&o jinx. the state b&o has different thresholds and different classifications. A business which is classified as a service in Tacoma might be a retail business under State Classifications. 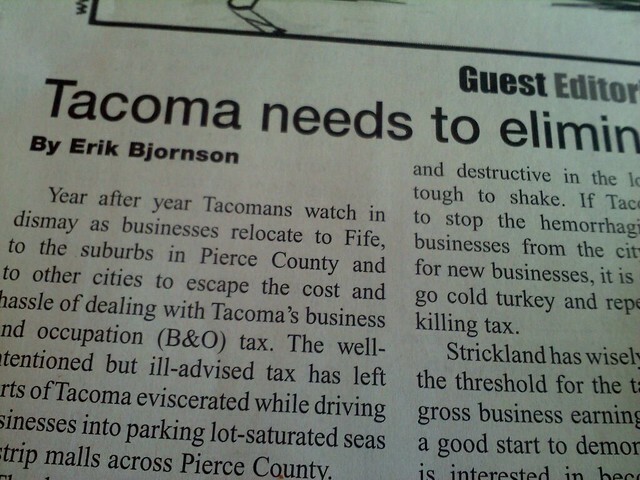 and business which is too small to be taxed by the state may not escape the Tacoma tax. It's wildly complicated. Still the existence of any tax is a turnoff to prospective businesses. by Marty on 11/12/2010 @ 6:00pm Can some confirm this for me? I had heard that one of the reasons mints left WA was because the tax assessment on the inventory. The state changed a law that assessed taxes on the face value of the inventory in stock. by panachronic on 11/12/2010 @ 9:31pm Erik, that photo is an excellent illustration of our woes. Just a week or so ago, I drove south down Fawcett Street, from 11th all the way to 25th, and it is shocking how much underutilized property there is so close to what is supposedly our downtown core. And the thing of it is, it doesn't look that much different now than it did when I was a kid, in the 70s. If anything at all has changed in those 35 years, it would just be the removal of some of the derelict buildings. To put it in perspective, imagine driving through downtown Seattle, eastbound on, say, Pine Street, and feeling like you just wandered into Detroit as soon as you crossed 4th Ave. This makes me want to go pull old aerial photos from the GovME site. I wonder if you can see that area start to die around the time they originally imposed the B&O tax, in the early 50s. by jenyum on 11/12/2010 @ 9:53pm Yes, you can. I also wonder if that is when the parking requirements started. 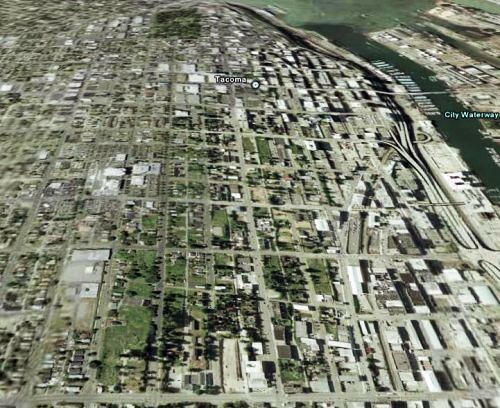 Yes, huge swaths of downtown Tacoma and many of the cities' "business districts" look as if they were carpet bombed in the 1940s and never rebuilt. @jenyum: the off-street parking requirement was placed in most cities after WWII. Tacoma's problem is that they got a bit excited in the "urban renewal" and secured a lot of funds to tear down buildings and they did so with misguided glee. by L.S.Erhardt on 11/12/2010 @ 10:18pm Of course, I have to ask what the other major cities in the region (Seattle, Everett, Bellevue and Fed Way) have in terms of a B&O tax. Comparisons are always interesting. If you own a business in Tacoma, you are familiar with the city's Business and Occupation (B&O) tax. Enacted by ordinance on Jan. 1, 1951, the tax code directs a portion of the revenue generated by businesses to the city's general fund to pay for a variety of services such as street repairs, libraries, and emergency services such as police officers and fire fighters. The tax comprises nearly 20 per cent of the city's general fund budget, but many business owners have complained it is an obstacle to businesses and economic development. Tacoma City Council is expected to vote in October on whether to modify a nearly-60-year-old ordinance that has governed how City Hall collects revenue through its Business and Occupation (B&O) tax. The issue received much discussion Tuesday during council's noon study session. "This supports small businesses and is a long-term strategy to make Tacoma a desirable place to do business," said Tacoma Mayor Marilyn Strickland, who presented a plan to change the tax policy. According to the city's tax and license division, if you are a business owner who earns $75,000 or more in gross revenue this year, you are required to pay the tax (last year, the figure was $72,500). Under Mayor Strickland's plan, that so-called "threshold" could be raised to impact only business owners who earn more than $250,000 in gross revenue. If Council changes the ordinance, approximately 4,900 business owners who fall below that threshold would essentially receive a break on their B&O tax bill. Many businesses in town could end up not paying business and occupation (B&O) taxes in the near future. Established in 1951, this stream of revenue goes to the city�s general fund to pay for services such as street repairs, libraries and police and fire protection. It makes up about 20 percent of the general fund or $80 million per biennium. Next month Tacoma City Council is expected to vote on changing the city�s B&O tax ordinance. Under the current system, a business that generates $75,000 or more each year in gross revenue must pay the tax. Under a proposed system being promoted by Mayor Marilyn Strickland, this threshold would be raised to $250,000. An estimated 4,900 businesses generate less than this amount each year. Council members discussed the proposed change dur-ing their Sept. 14 study session. Strickland said there are two key positions to examine. The first is that the city needs every penny of revenue it collects. The second is that it does not understand the concerns of businesses. �I want to bridge that gap,� she remarked. She noted that 20 percent of the B&O tax paid by Tacoma businesses goes to the city; the remainder goes to the state. Councilmember Ryan Mello expressed support for the change. �The signal it sends to businesses locating here is incredibly strong,� he said. Councilmember Jake Fey has heard of businesses locating in adjacent cities with no B&O tax, notably Fife. �They have made a very direct choice to move out there,� he said. Retail businesses with gross profits of $250,000 pay the city $383 in B&O taxes and $1,100 to the state. For service businesses, these figures are $1,000 and $4,500. Jodie Trueblood, director of the city�s Tax and License Division, noted this is because service businesses are considered to have less overhead and greater profits than retail businesses. Trueblood noted that Bellevue has a threshold of $125,000. Half the businesses in Bellevue pay no local B&O tax. The threshold in Seattle is $80,000, while in Everett and Olympia it is $20,000. The committee voted to approve the proposed change. by panachronic on 11/13/2010 @ 2:37am "...a revenue-neutral solution." We all know what that means. Local-option vehicle excise tax, anyone? Local-option sales tax? We know full well she's not even considering any budget cuts. by fredo on 11/13/2010 @ 6:43am "Strickland said many business people she has spoken to do not realize there is a city and a state B&O tax." Unfortunately, those business people are not the ones who make decisions about where to locate a major business. This sort of reasoning should be sufficient to tie up the proposal for years while Tacoma's disinvestment spirals unchecked. Interestingly, when the city discusses stamped crosswalks, new furniture, reconciliation parks, new baseball stadiums, murals, bike lanes, and raises for city employees the issue of "revenue-neutrality" is never a problem. But since it is such a big stumbling block I will once again present a revenue neutral solution. Couple the reduction in b&o tax collections with a reductioin in the level of pay for city employees. These people are already overpaid so my proposal actually kills two birds with one stone. by Jesse on 11/13/2010 @ 9:36am I say raise the B&O tax outside of the downtown core and completely eliminate it downtown. This would be "revenue neutral" and encourage growth in the core --- where you want growth in the first place! In fact, you could create "impact zones" where there is no B&O taxes so the city could guide businesses where you want them. IE-- zoning the gravel pit at 512 and I-5 as a free zone and the Tacoma Mall as a high zone also using zoning ordinances to stop development around the mall and actually reverse it over time and forcing it out further. Thus ending up with two malls. One at 512 and I-5 and one downtown. Can something like this be done? It'd solve a lot of Tacoma's woes IMO. Well, yes something like this could be done...and has! About 15 years ago the city established an International Finance district and businesses of that type all got their b&o rates slashed. I'm not sure if that worked or not. We still have the district but I don't know if it ever attracted any International Investment companies. Maybe Marty would know. by Jesse on 11/13/2010 @ 9:48am The IFSA is only a few blocks and only for the financial industry, right? If it were to open up for all industries and comprise of the whole DT core, I bet we'd see better results. Perhaps use the new zoning regulations as a guide for this policy. They have already determines which places are considered "business districts". Have no B&O in those places and up it in places where there's sprawl, suburb businesses, etc. Oh, and the mall. I hate the mall and what it does to the DT core. by Crenshaw Sepulveda on 11/13/2010 @ 10:18am Seattle got our IFSA. by panachronic on 11/13/2010 @ 12:55pm "About 15 years ago the city established an International Finance district and businesses of that type all got their b&o rates slashed. I'm not sure if that worked or not." You're not sure? Does the exit of Tacoma's premier financial services company to Seattle have any bearing on your assessment? Or did you forget to use the sarcasm font? by Crenshaw Sepulveda on 11/13/2010 @ 1:48pm A big time reduction in the B&O didn't seem to keep Russell in Tacoma. Maybe it just provided them with the extra money to fund their move to Seattle. If you want to keep business in Tacoma you should tax them to the point that they don't have the money to move away. by fredo on 11/13/2010 @ 2:09pm i was waiting for the first wise guy to point this out. right, the high b&o tax might hobble local businesses so much that they couldn't afford to leave. but it still wouldn't provide an incentive to get prospective businesses to locate here. Erik has already pointed out that new businesses just locate outside the city limits in Fife and other surrounding communities. From that location they enjoy what is essentially a parasitic relationship with the city. by Crenshaw Sepulveda on 11/13/2010 @ 2:25pm Fife, ewww. Except for Pick Quick. I understand that Fife was Russell's second choice. by fredo on 11/13/2010 @ 2:36pm they also have quite an exceptional emissions testing station. the last time i visted the station a butchy young gal named Pat said I had good emissions. by Crenshaw Sepulveda on 11/13/2010 @ 3:11pm ewwww, now i'm thinking about fredo's emissions. by panachronic on 11/13/2010 @ 3:12pm "they also have quite an exceptional emissions testing station"
You mean you FOUND it? by jenyum on 11/13/2010 @ 3:28pm They do a robust business in Fife, pulling people over for expired tabs on the way to the emissions station. by panachronic on 11/13/2010 @ 3:34pm That might explain why they put it in a location only discernible to The Amazing Kreskin, who is probably the only human alive who could find it with less than 30 minutes of searching. BREAKING GOOD NEWS: City of Tacoma tables indefinitely proposal to decrease B&O threshold to $150,000. Hence, to the benefit of businesses that may want to locate in Tacoma, the B&O threshold remains $250,000!! Tacoma keeps on message that it is open for business! by low bar on 12/21/2011 @ 1:07am This just in.....Seattle and or Portland are waaaaaay neater places to live in.